Vernon iN Normandy, France is often passed by or just driven through en route to its well known neighboring village Giverny. ‘Discovering’ beautiful places along the roads less traveled is one of our passions at iNSIDE EUROPE – and the mediaeval village of Vernon is one of those gems. 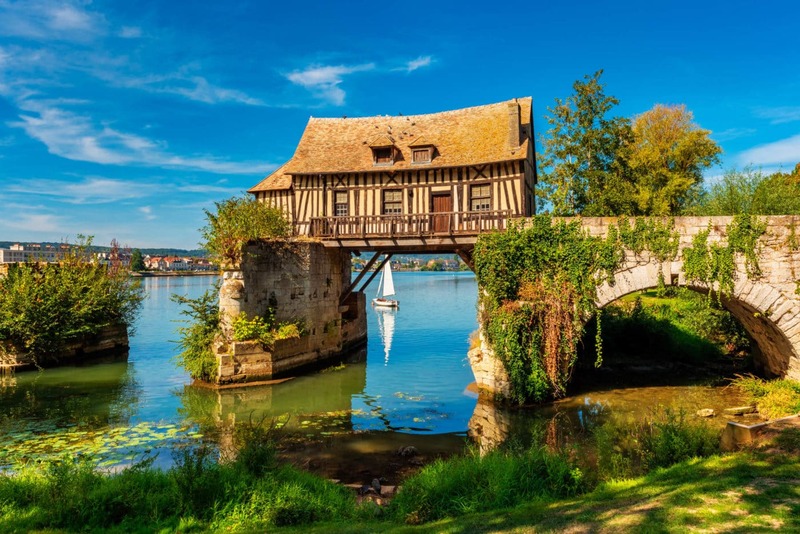 Seine river cruise travelers however may know the stunning landmark dating back to the 16th century pictured here: The Old Mill. Missing the wheel that once operated the mill, what’s left today is a unique half-timbered house seemingly ‘stuck’ on or between two remaining piers of the ancient bridge from the 12th century across the Seine river. Nowadays, the old mill is a beloved symbol of Vernon. It illustrates even the postal logo of the city. For further reads on the turbulent history of the mill that once also belonged to an American, take a look on this site.